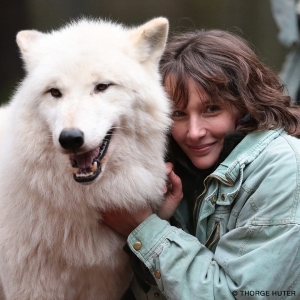 World-renowned pianist Hélène Grimaud is performing with the Stamford Symphony Orchestra on April 25th and 26th to raise awareness for her other passions - environmental education and wolves! In addition to being one of the most celebrated pianists of our time, Grimaud is a highly committed wildlife conservationist, human rights activist and author. In 1996 Grimaud founded the Wolf Conservation Center (WCC), a 501(c)(3) not-for-profit in South Salem, NY committed to preserving and protecting critically endangered wolf species with purpose and passion, through carefully managed breeding, reintroduction, and inspiring science-based education programs to both children and adults alike. The Wolf Conservation Center is an environmental education organization committed to conserving wolf populations in North America through science-based education programming and participation in the federal Species Survival Plans for the critically endangered Mexican gray wolf and red wolf. Through wolves the WCC teaches the broader message of conservation, ecological balance, and personal responsibility for improved human stewardship of our World. For more information, visit www.nywolf.org and follow on Facebook and Twitter. New Canaan Editors Note: I took my parents back to visit the wolves today and it was once again fantastic. The sanctuary is only 20 miles away from New Canaan. You also see Hawks (we saw Red Tail) buzzards. Check out my video of Alex feeding the 'Ambassadors' on our Facebook Page HERE.